Videocon D2H will provide 4K Ultra HD DTH service in six months. Two direct to-home TV (DTH) carriers are start in the race for the 4K Ultra HD services in India. While Tata Sky had previously announced that 4K decoder (STB) will available in early 2015. 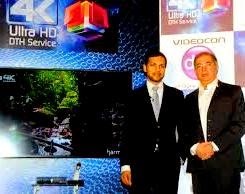 Videocon d2h dth today also announced that the launch of Videocon D2H 4K Ultra HD services will take place in six months. It is expected that the starting price is 10,000 rupees per 4K set top box. However, CEO Videocon D2H Anil Khera said that it may come to Rs 6,000-8,000. "While there are some boxes for testing purposes, not long to do at home and the cost will be around Rs 6,000-8,000 Import From now on, we have our ability to launch 4K ultra hd TV channels. We can send the 4k TV signal and successfully decode them in our houses using 4K ultra HD set top boxes, Khera said. 4K Ultra HD offers 3840 x 2160 (16:9 or 1.78:1 aspect ratio). This technology allows the image quality with fine detail to almost photographic emulsion texture and sweetness. "4K revolutionize vision services in this country. 4K provide the images with such clarity, finest details and nuances that the differences will be incredible offer," Khera said. Khera believes India is a new technology growth, much faster than expected. "We will launch the service in the next six months. We expect our customers the HD 4K UHD level. Sold with increasingly flat 4K, we would be 30 to 40 percent of it," he said. Videocon D2H will not use MPEG-4 DVB2 4K. "In this format, occupying a space of up to 20 channels for standard definition. Instead 4K STB will works in high efficiency video compression (HEVC), which is 50 percent more efficient than MPEG-4 technology other be used DTH players, "Khera said. To start broadcasters to produce content in this format, Videocon D2H UHD is where content providers can make their content channel to provide 4K. It uplink of Greater Noida facilities of the company. Although earlier in the day, the boss Saurabh Dhoot Videocon D2H said the introduction of services 4K Ultra HD channels will stimulate in order to make the jump. Only a few countries such as Japan, the U.S. and the UK have content in this format. "As a leading provider of DTH, Videocon D2H is committed to deliver world technology in Indian homes through our innovations. 4K Ultra HD dth is the latest display technology. Preview We have successfully demonstrated our capabilities today and technology, said Dhoot. So far, Tata Sky has to be delivered into a contract with Technicolor, a 4K-STB volume for the beginning of 2015 registered. In fact, Tata Sky is ready to give Friday service officially announced their ultra HD 4K TV cahnnels.